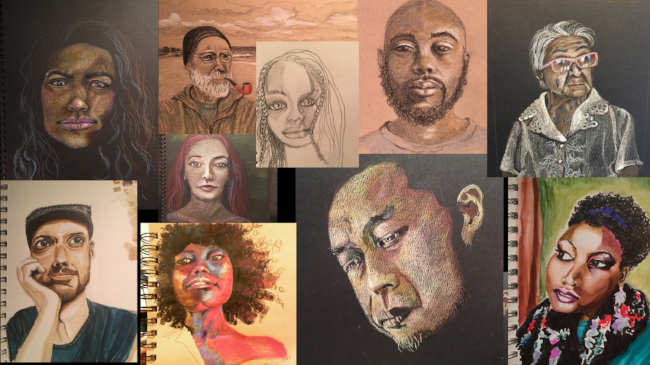 Maybe the reason drawing or painting people seems harder than anything else is because we think we know what people look like. We trust what we think more than what we observe. We fail to really study. We fail to look closely. We trust what we think more than what we see. In the drawing challenge I took with the Sktchy app, 30 faces / 30 days, over and over the instructors reminded us to look more at the reference photo and NOT look at the features as an eye, a nose, a mouth, but to study the light shapes, the dark shapes, and to look more closely. As soon as we allow ourselves to believe our thought, "I am drawing a nose," we draw what we think a nose looks like. We don't draw the nose right in front of us. With every shape and shadow, every line and shading area I worked on throughout the 30 day practice I had to remember to look at the subject. As soon as I studied my drawing, trusted my thoughts, or believed too much in my own abilities, I forgot to study the reference image, I lost focus on the subtleties of the subject in the inspiration photo. If I trusted my memory or idea of what a particular feature looks like more than I trusted my eyes and my hands, I almost always ended up erasing or starting over. If I stopped to capture these diversions, I bet more people would understand how off track my drawings actually get! They wouldn't perceive my "talents" solely based on the end product. Throughout the practice, my perceptions and assumptions kept grabbing my attention more than the shapes and shades that make up THIS nose, THESE eyes, THIS face. With each day I got better at catching myself drift away from seeing. The longer I could stay focused on observing what is, the more drawing there was than erasing. It frustrates me when people comment on how naturally talented or gifted I am. I can't seem to describe how much the practice makes this possible. It is precisely when I think I have some ability that I lose the real skill, the novice's attention and focus on the subject, the curiosity, the reverence, like looking at an object for the first time. It requires that I surrender any idea, assumption, perception, or confidence. The mindful observation, the fresh, first look, the reverence for the object, the curiosity and courage to be surprised, these are the elements that are required to let something new show up on the page. Letting go of our assumptions makes way for us to see what is. I love making art because as long as I am humble, curious, and vulnerable, something could show up. I may get to discover something I assumed wrong a million times before. I develop reverence for every subtle rise and fall of a cheek bone, every dimple, divot, or crease. I love studying every hair on a precious head. "The love in this family." These moments of reverence are fuel for me to practice what opens my eyes. This very humble practice reminds me over and over how easily we allow ourselves to be distracted. May we be inspired to practice every moment. To see each other as we were created to be seen, with open eyes, hearts, and minds, with curiosity, humility, compassion, with reverence for every shape and shade.